President Donald Trump waves to reporters as he arrives at Walter Reed National Military Medical Center for his annual physical in Bethesda, Md., Feb. 8, 2019. BETHESDA, MARYLAND — Doctors examined U.S. President Donald Trump on Friday for his annual checkup, the second of his presidency. Trump, 72, arrived aboard the Marine One helicopter at the Walter Reed National Military Medical Center. 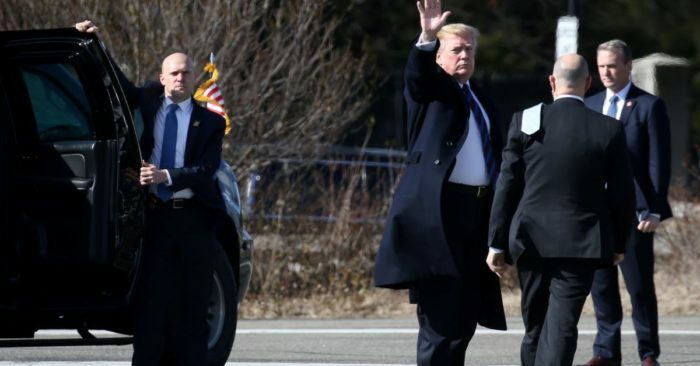 He waved to a group of journalists before stepping into a large, black sport utility vehicle for a drive of less than one minute to the President’s Zone of the 98-hectare hospital run by the U.S. Navy just outside Washington, in Bethesda, Maryland. Friday’s comprehensive physical tests were being overseen by acting White House doctor Sean Conley, an emergency medicine physician who holds the rank of commander in the Navy. White House officials hoped this year’s examination would prove less controversial than last year’s, when questions were raised about the president’s health. Jackson said Trump had scored 30 out of 30 on the National Cognitive Assessment Test, rebutting concerns about the president’s mental health. The doctor also declared that he had told the president he “might live to be 200 years old” if Trump would just eat food that was more healthful. After the 2018 physical, Jackson told reporters the president weighed 108 kilograms (238 pounds) and could reasonably lose approximately 4 to 7 kilograms (9 to 15 pounds). Trump later nominated Jackson to run the Department of Veterans Affairs, but the admiral withdrew his name after allegations of misconduct surfaced, including accusations that he had improperly dispensed medication. The admiral denied the allegations, which Trump called “lies,” and the president subsequently recommended him for a military promotion. Trump recently promoted Jackson to White House chief medical adviser. Tags:Donald Trump mental health Categories: U.S.